This is a prompt I give to students. I also write or rewrite it thoughout the year. Here's my latest . . . WHEN I WRITE, I get just a little jumbled. I take myself oh so seriously. I think: here goes. I hold my breath and jump into a pristine reservoir, only to muddy it up. I begin wondering, how the heck is this going to turn out? And why the heck am I doing it anyway? When I write, I'm stepping onstage naked, and the butterflies collect and flutter and hover and multiply. In a few minutes, this page will fill with words and my reader will be able to tell - instantly - if I'm any good. Yes, the reader (perhaps you) will judge me. Oh, crap. Her stuff stinks. There's nothing creative, juicy, freeing, or fun in that. Nothing engaging, heartbreaking, hilarious or original. 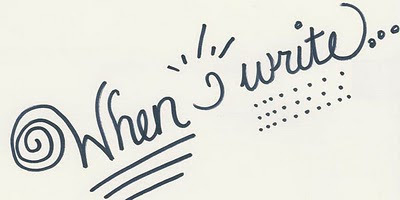 What I've learned is that writers are ordinary people and I'm ordinary too - and if I simply listen, engage, and take on the task of responding to the prompt, I can't help but connect to something interesting. A voice never before heard will murmur, shriek, chortle, whine. Suddenly there are sentences that have never existed before. They shimmer in the air like cherubim. Your turn. 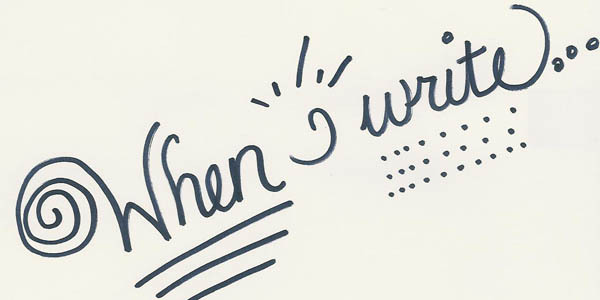 The prompt is "When I write. . . "